Pfc. Walter R. Van De Walker, 19, was wounded in action on Iwo Jima, his parents, Mr. and Mrs. G. H. Gifford, 2644 S. Helen street, have been informed by the War Department. He was a member of the Third Marine division that played a major role in the fierce Pacific battle, and also participated in the battles of Guam and Morotai. A former student at East high school, Pfc. Van De Walker is convalescing in a hospital in the South Pacific. The young marine also has several brothers in the service, including Pfc. 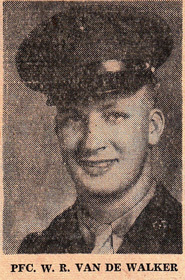 Roland Gifford, recently home on furlough after 33 months in the South Pacific; Seaman Second Class George Gifford, who is attending an engineer school at the Great Lakes, and Seaman Second Class Willard Gifford, also at the Great Lakes. Another brother, Don, plans to leave for training in the marines immediately upon graduation.